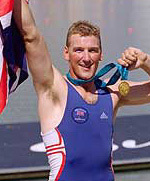 In one of the classic sporting moments of all time, Sir Matthew Pinsent led the Great Britain coxless four to victory at the Athens Olympic Games in 2004. Just eight one hundredths of a second ahead of the Canadian Champions, the win booked Matt's place in Olympic history. Now as training camps become a distant memory, Matt is using his time for other sporting, commercial and media projects. Whether you are here to find out about Matt's career or have just came along to browse through, you will find the latest news and inside information right here.